When I started my road trip around Australia I thought it will be enough places where I will be able plug my camera or laptop charger. 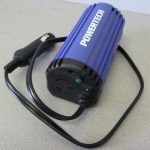 Right…After first couple days I bought power inverter. It doesn’t cost so much and it is real time saver, as you don’t need search for the place where to charge your equipment. And it can be near impossible to find power in remote areas. Before long trip check how much power need for your devices and pick up one of so many available power inverters to be sure you’ll be able to charge your camera’s batteries and take those precious moments of your trip. Power inverter in cars are really of great help to distance travelers like me because like what you experience, it saves me so much time in looking for places where i can charge my laptop and phone.